Grit Martinez: "Eutrophication is an issue of cultural politics." The Baltic Sea is among the most polluted water bodies in the world because of poor land and water management in the basin. In many cases, water resources in the Baltic Sea region are transboundary and flow across national borders linking neighbours in management and development challenges. 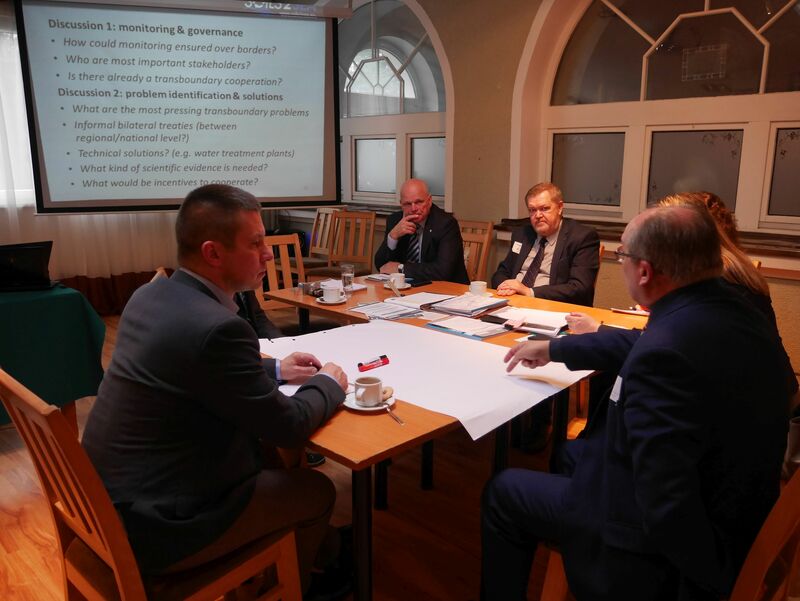 After many years of silence amongst Polish and Russian authorities, a meeting between regional water authorities from Olsztyn in Poland and Kaliningrad Oblask in Russia was arranged in eastern Poland with the support of Ecologic Institute. The workshop took place at the German Polish Youth Center in the historic premise of the city of Olsztyn (also known as Allenstein). The Łyna – Lava, is a river flowing through northern Poland's Warmian-Masurian Voivodeship and Russia's Kaliningrad Oblast. With a length of 270 km and a basin area of more than 7.000 km², the river is an important transboundary watershed in the Baltic Sea region. During the workshop, Polish and Russian participants constructively discussed transboundary management of the Łyna – Lawa River. Using the world cafe method, participants focused on the most pressing transboundary issues, incentives, mechanisms and ways forward to improve monitoring of the water quality of the Łyna/Lawa-River and to foster communication. One of the major problems was seen to be the lack of cooperation between Polish and Russian authorities at the regional level while day to day routines at local levels across borders seem to function. It was stated that the departments for environmental protection at regional and national scale seem to have created obstacles in working together. The workshop participants from regional and local water authorities and municipalities, service departments, environmental agencies as well as scientists expressed the need to deepen the relations between environmental governing institutions of Russia and Poland. The Russian-Lithuania transboundary water cooperation was named as a positive example in this respect. To improve cross-border coordination between Russia and Poland, it was suggested to follow the existing examples of effective cooperation at the local level for the Łyna – Lava River.